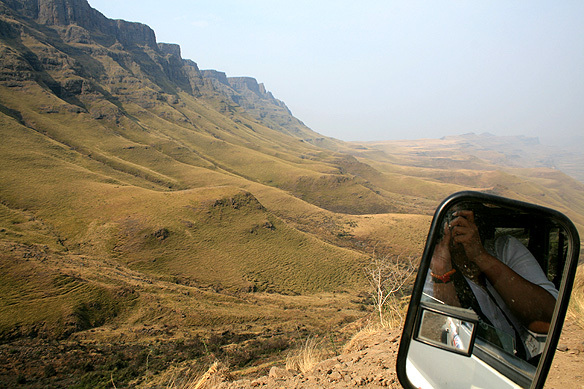 Once a rough mule trail, Sani Pass is now a notoriously dangerous mountain road to Lesotho via the Drakensberg Mountains which can only be traversed by a 4X4. 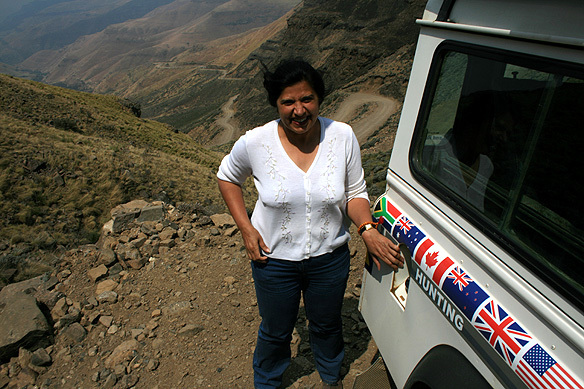 Lying between the border controls of South Africa and Lesotho, the 8-kilometre-long gravel road through no-man’s land starts at 1,968 metres above sea level and ends near the summit at 2,873 metres. The journey is marked with steep ascents, hairpin bends appropriately named “suicide bend” and “big wind corner”, loose gravel, and beautiful views. Some walk this road. For the adventurous, the thrill is in the 4X4 drive. The border between the two countries closes at 4 pm and is shut during bad weather. Just past the border post in Lesotho is the highest pub in the world serving three-odd items from its menu of two dozen. Their chicken burger is one of the best I have ever had. When there are a lot of customers, the pub runs out of food. Today was windy, like crazy. Every time I got off the Land Rover, I felt I was going to be blown away into the deep desolate valleys and smashed into a zillion pieces, and had to hold on to branches and the basalt face of the mountain rock to stay intact. The loose dust from the gravel road created hazy mists as we drove higher and higher above the jagged gorges. It was splendid. 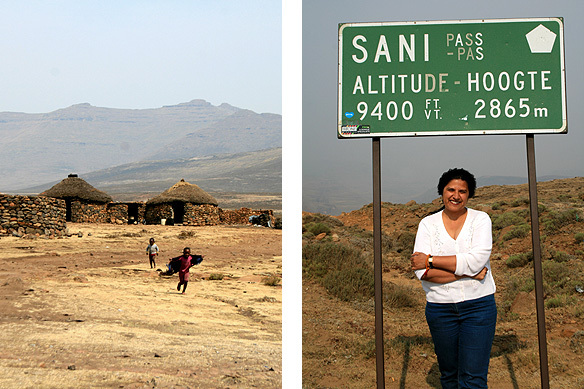 For some fascinating details about the Sani Pass, read here. 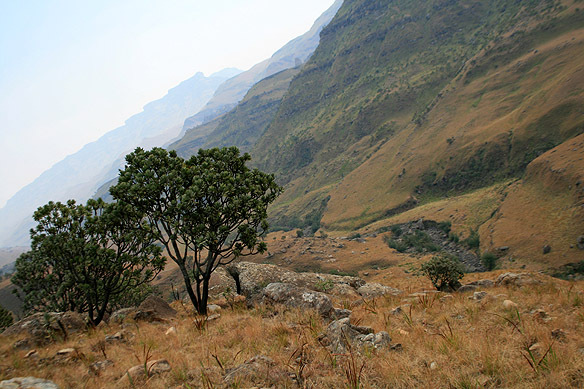 Alpine grasslands cover the Drakensberg. 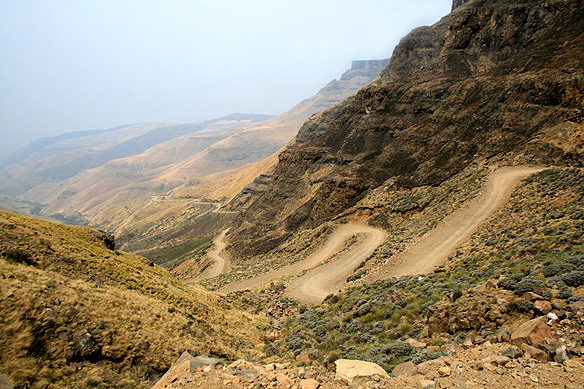 The Sani Pass was built by David Alexander between 1948 and 1956. Tiny villages pepper the mountain plateau in Lesotho; 40 percent of Lesotho’s population live below the international poverty line of US$1.25 a day. First Stop: A boat cruise in the St. Lucia Estuary looking for hippos, crocodiles, and endemic bird-life. The estuary is part of the Greater St. Lucia Wetland Park, now renamed iSimangaliso [‘marvel’ in Zulu] Wetland Park. It is truly a marvel. South Africa’s first World Heritage Site (1999), the pristine park stretches over 200 kilometres of coastline and protects five individual, yet interdependent ecosystems. 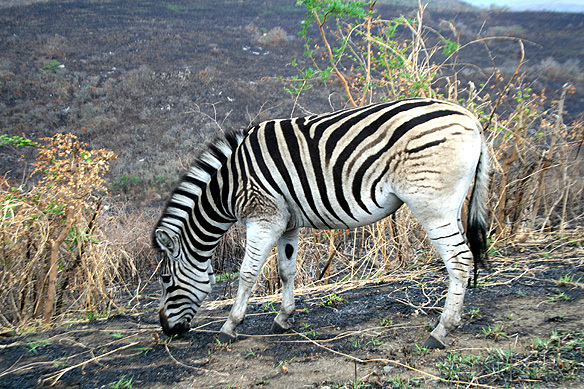 What is unique about the park, and fortunate for all sides of the equation, is its combination of natural habitats which boasts some of the largest variety of species and minimal human interference. 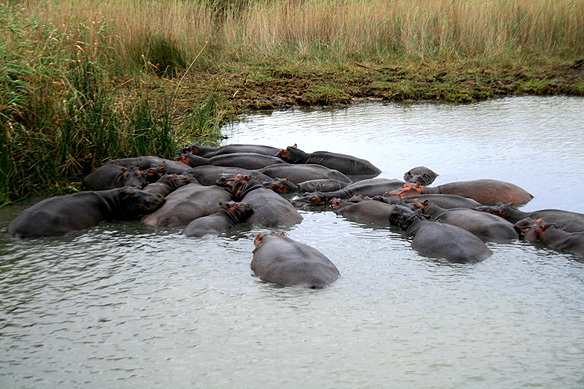 A herd of hippos at the St. Lucia Estuary. Second Stop: Hoping for close encounters with Rhinos and other members of the Big 5 in Hluhluwe-iMfolozi [pronounced shlushluwe-mfolozi], South Africa’s oldest game reserve. Established in 1895, the reserve embarked on Operation Rhino in the 1960s to save the White Rhino from extinction and succeeded in increasing its population in the country from a meager 500 to 6,000 (2009). Presently, it is focussing on saving the Black Rhino. 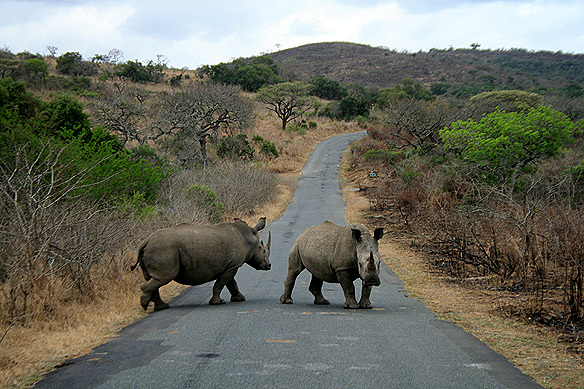 One-fifth of the world’s black and white rhino population is in fact found in this reserve. Yes, I was lucky. I had lots of close encounters. 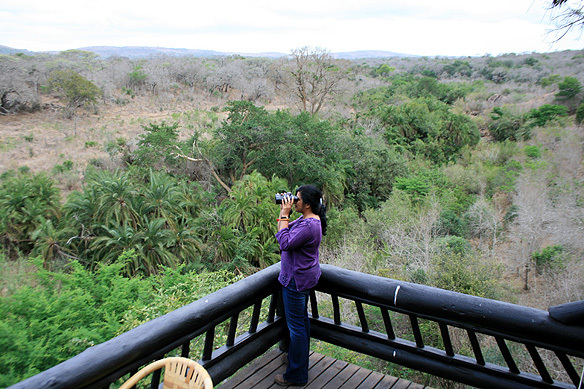 Looking for game in the Hluhluwe-iMfolozi game reserve. Top: The endangered White Rhino; Bottom: Burchell’s Zebra. 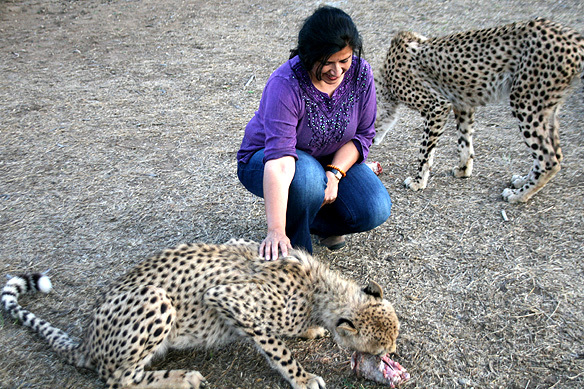 In the company of Juma and Mayo at the Emdoneni Wild Cat Rehabilitation Centre. Such a perfect ending to two beautiful days exploring the wild side of KwaZulu-Natal … I may travel the world, but those few moments looking into the silent eyes of a zebra, caressing the mane of a self-engrossed cheetah, marvelling at the matriarchal love of the elephant for her herd, and hungrily following the rhino’s path as it makes its way through the maze of thorn trees are simply priceless. Once you’ve been to Africa, the pulse of the wild, thereafter, somehow invariably beats in your own veins, forever. This entry was posted in Exploring our World, South Africa and tagged Adventure Travel, David Alexander, Drakensberg Mountains, Emdoneni Wild Cat Rehabilitation Centre, Game Reserves, Greater St. Lucia Wetland Park, Highest Pub in the World, Hluhluwe-iMfolozi Game Reserve, iSimangaliso Wetland Park, KwaZulu-Natal, Lesotho, Operation Rhino, Sani Pass, South Africa, South African Tourism, St. Lucia Estuary, Things to do in South Africa, UNESCO World Heritage Site, Wildlife by Rama Arya. Bookmark the permalink.